My Garmin was reading 51km as our group of riders paused briefly to agree the rendezvous point before we tackled the pass ahead. 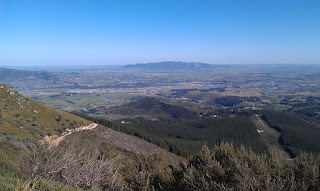 We’d done about 3 or 4km of very gradual incline since leaving the Paarl but the real work was still ahead. 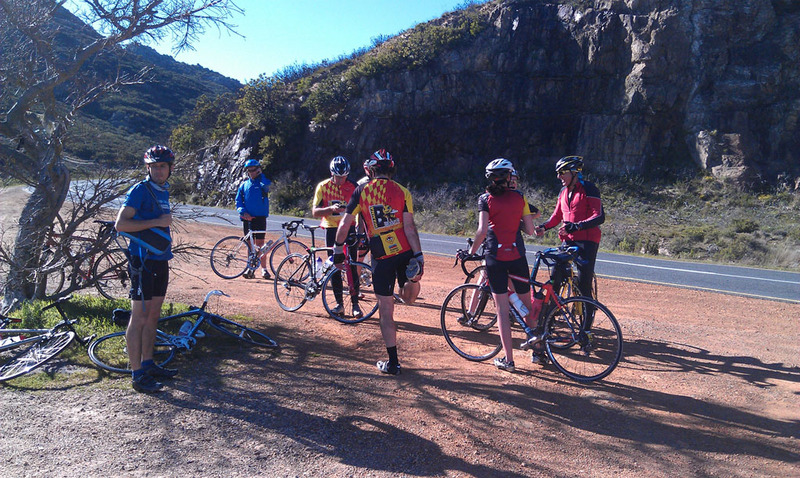 The Garmin would roll forward another 30km before we would all met up again at this spot. 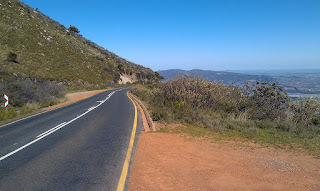 Despite a number of fellow riders re-assuring me that Du Toitskloof Pass was long but not steep, I was very definitely daunted. In fact I’d been nervous at the prospect for the last few days – I didn’t have any doubts that I would make it, but I was much less confident how much would be left in my legs afterwards to deal with the remaining 50km to home once the climb was behind us. 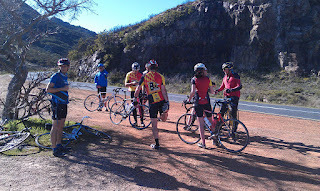 My nervousness wasn’t helped by a nasty crash in our bunch earlier that morning, less than 10km into the ride. The warning signal for a pothole hadn’t passed back to the tail of the group and Des went down as his front wheel pitched into it. John was close on his wheel and, being unable to avoid the fallen rider, ran into him, somersaulting bike and all to an equally hard landing on the road just beyond. Des immediately pulled out but somehow John rode on for a few kilometres. Frankly I’d have been too battered to continue but John either knows how to fall better or is just plain tougher than me. Sadly his bike wasn’t so tough and it soon became evident that his rear derailleur was too badly broken to continue, forcing a second early retirement before we’d even reached Stellenbosch. As if that weren’t enough, to cap off my unease was the knowledge that the temperature was forecast to be over 30 degrees by the time we started the return leg. And that forecast was for Somerset West, Paarl is frequently hotter by several degrees. The moment was here though – no longer any point worrying, it was time to get cracking and get the job done. Having driven the road a few times before I already knew what a majestic sweep of tarmac lay before us, and how fabulous the views over the Paarl winelands were for the whole of the journey to the top. So if the legs or lungs started to falter, a quick glance at the jawdropping scenery to the left should at least provide a mental boost to my efforts. The downside of having driven the pass before was knowing exactly where the top was, and it’s appearance high up on the distant hillside was a sobering sight. Over the first couple of kilometres I was surprised to find myself not far off the leading group, but I knew that would not last even before Penny commented that they’d start accelerating soon. As the road swung right into the cool shadow of the deep horseshoe corner before it’s straight ascent up the side of the mountain, I dropped a gear and settled back into a steady pace which I hoped would be sustainable for the rest of the climb. Even before the road swept back left out of the hairpin both the lead group and Penny were already matchstick figures across the widening gap, and I began what I imagined would be a solo battle to the top against the sudden blasts of a gusting wind. I was wrong though. “Latch on Rob“, came a friendly call from Paul and Alita as they passed me. “I think I’ll just need to grind this one out to the top“, I replied and prepared to watch them slowly disappear as well. “Yes thanks Paul, hanging in for now I think. Not sure I’ll be with you all the way but appreciated the help” I responded. Maybe I hadn’t really caught them, maybe without looking back, Paul had slowed ever so slightly to encourage me join them. Either way, I was very grateful of the company. Just as John, Penny, and everyone had predicted, the climb wasn’t steep. It was relentless though, and long. I forget which of us remarked first on how cool it was to be tackling a climb of similar length to those you see on mountain stages of the Tour de France, albeit with a considerably kinder gradient and lower summit. I also remembering commenting that I’d been looking forward to this ride for weeks, although now I was actually on it, sweating and puffing like a broken steam engine, I wasn’t quite sure why. Somewhere, I’d guess it was a little beyond half way, we caught up with Graham, and as we briefly became four riders I decided I had to at least make some token gesture of helping the cause and took the lead. We dropped our pace a little but, struggling with a chest cold, Graham told us he wanted to go at his own pace and we must push on ahead. I picked up the pace again, and stayed at the front for a little while longer. Some time later we saw a group of bikers parked on the left, and it wasn’t until I saw the road’s final sweep right across rather than up the hill, and noticed two of our riders under the shade of the tree that I realised we’d reached the top. It had taken about an hour to get there, but the company, the views, and the steady effort, had compressed time so much that it actually seemed like just a few minutes. “Made it” was the simple text I sent to Yoli, with a photo attached just to prove it. Behind those two words though was a great sense of relief and more than a little satisfaction at having ticked off this fabulous climb from my list of must-do rides. After a quick stop for a breather we started the rewarding blast back down. Even at my cautious pace, it took less than 20 minutes, but in another bizarre warp of time and space the journey down seemed to be about twice the distance of the route we’d cycled up. 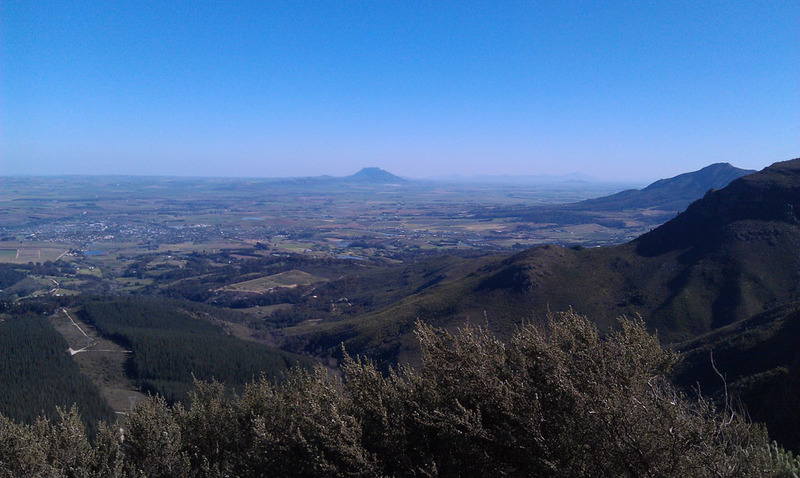 The ride home was in fact hotter than the forecast had promised, and I was very glad of the stop in Paarl to fill up water bottles. A couple of weeks back I started upping the calorie quota in my energy drink bottle, which definitely helped keep me going longer and stronger over the last stretches of the ride home. We’d kept together well as a group on the way out and the initial stretches home through Paarl, but our pace quickened along the later stages of the R101 back to the four way stop at Klapmuts. Without John’s leadership, the inevitable happened and the group split was we started along the R44. I just about clung on to the fast bunch to the top of the Wiesenhof hill, but with 30km still to go I knew my legs would last at their pace, and so once again I settled in to what I imagined would be a solo effort home. Again I was wrong, and again it was Paul who proved it. 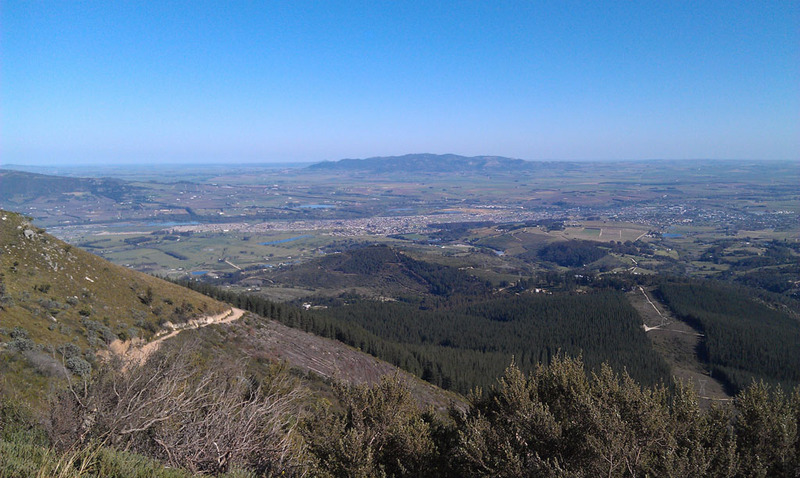 This time he was ahead of me but as we reached the outskirts of Stellenbosch I realised I’d steadily been gaining on him, and with the gap down to less than a hundred metres I put in a few quick turns on the cranks. “Not much left in the legs, I reckon it’s time to take it easy for this last bit” I said as I pulled alongside. Paul hardly had time to respond, before another rider, also called John, joined us and again we were three for the last small effort home. I was pleasantly surprised how little pain and cramping I was suffering and how much I had left in my legs for the last ramps up Yonder Hill and then Irene Avenue. I’d paced my effort well over the 130km and finished tired, but not exhausted and only a little sore. Du Toitskloof Pass had not disappointed either. It took more than two centuries from the original idea for the pass in 1725, to it’s completion in 1945. 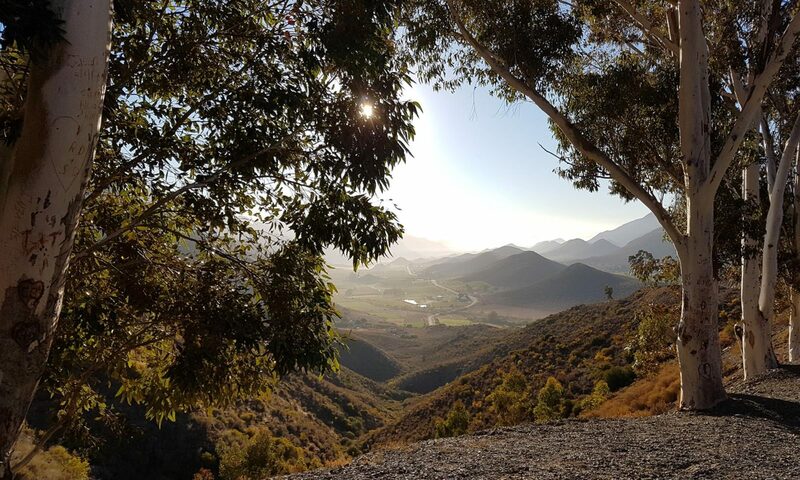 Numerous passes with lesser engineering challenges were built in the interim, including the nearby and equally majestic Bainskloof which is also high on my must-do list of rides. Having been superceded in 1988 by the Huguenot Tunnel, the pass now seems to be mostly used by trucks, presumably looking to avoid the toll, and bikers enjoying the thrill of speeding through the snaking corners. 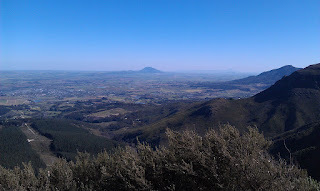 And of course cyclists like ourselves this weekend, looking for thrills of a more energetic kind.